Renowned Harvard Business School professor and strategist John Kotter, in his book Leading Change, cited an eight-step process for creating and exacting major change. Though the primary focus of Dr. Kotter’s book was organizational change, the steps outlined can be directed at any entity, whether an individual, corporation, or any organization. Key elements and focus of the process can be implemented. It is important to note, however, that while the change is instantaneous, the transition is emotional. Therefore, in order to change or enact change, it is important to not just focus on the change but on the process for achieving the change, namely, transition. Transition is the emotional strength for effective change. 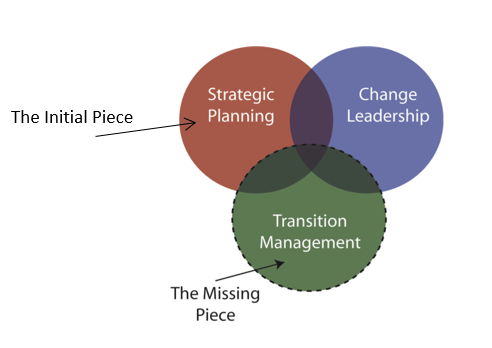 However, organizations rarely focus on transition. As we move forward with the organizational change process, it is important to note that both Kotter’s and Bridges’ concepts will be incorporated into the strategic plan development. Further, the actual development of the organizational plan will reflect key work done by Robert B. Duncan, the Richard L. Thomas Professor of Leadership and Change at Kellogg Graduate School of Management, Kellogg University. The Strategic Change Cycle focuses on the minutia and the mechanics of the development process, while the Organization and Culture focuses on the emotions that the change provokes, ranging from what the organization hopes for and the reality that exists. All of the above will be used to devise a proper plan for our client and will result in a substantive change that will align the organization with its desires and re-direct and focus the organization on key strategic and tactical items that will be integral components in its success.